Broadcaster Alan Jones said on Q&A that the cost of wind power far outstrips the cost of coal power. He admits he was wrong. I think you have rightly highlighted a ridiculous mistake that I made… why I said kilowatt-hours and not megawatt-hours and where the 1502 comes from, I have absolutely no idea. What I can tell you is that I’ve used figures for some time now on this issue to merely confirm that renewable energy is many multiples dearer than coal-fired power[…] I previously used that $79 figure but as you can imagine, it’s based on the price of coal. Wind has always been, in my words, three or four times dearer than that. […] But if I’ve said that, that is wrong, and I’ll be writing to the ABC to that effect. I have no comment to make other than to thank you for pointing this out to me. I guess we all make mistakes and I’m always happy to correct them when I’m told about them. Electrical energy is usually measured in kilowatt-hours (kWh) or megawatt-hours (MWh). Kilowatt-hours are the unit generally used for metering and charging residential electricity consumption, and represents the amount of energy a device drawing one kilowatt of power would use in an hour. A megawatt-hour is 1000 times larger, and is typically used to measure large loads or generators. The price quoted (A$79/kWh) is about 300 times more expensive than the typical retail price of electricity paid by residential customers around Australia (and about 2000 times more than current wholesale prices). Mr Jones’ error in saying kilowatt-hours instead of megawatt-hours is an easy mistake to make. A$79 per megawatt-hour is consistent with the range of costs reported by the Electric Power Research Institute for new coal-fired electricity in 2010, without carbon capture and storage or a price on emissions. 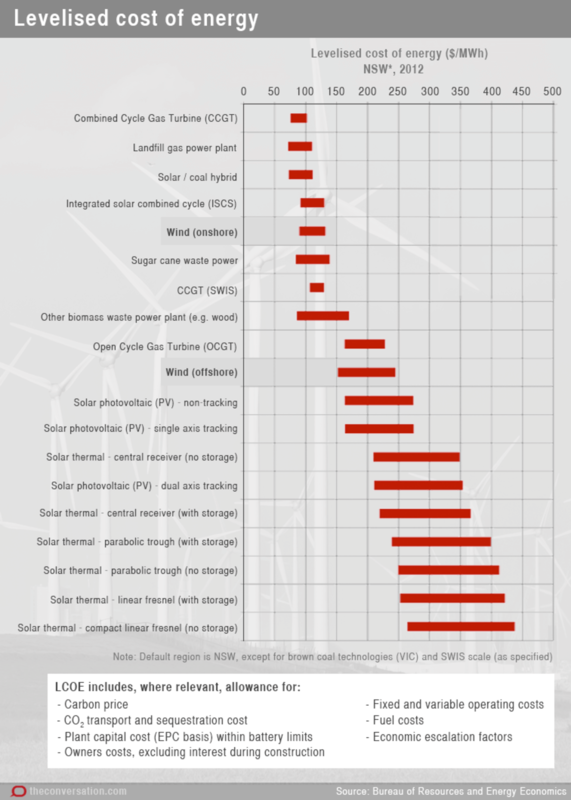 However, even with the right units, the figure of $1502 for wind power did not make sense. Mr Jones was not able to say from what source he got that figure of $1502 for wind power. So I decided to investigate. The claim that coal-fired power energy costs $79 a kilowatt-hour and wind power costs $1502 a kilowatt-hour pops up a few times on websites of groups opposing the renewable energy target, climate sceptics, and even in Hansard. Mostly, this claim is referenced to an unnamed Productivity Commission report released in 2010. Correction: An earlier version of this piece misquoted energy figures. The Productivity Commission said the cost of electricity generated by wind was $150 to $214 per megawatt-hour, not $1502; and solar was $400 to $473 per MWh, not $4004. So what did the Productivity Commission actually say? The 2011 Productivity Commission report that the Fairfax correction appears to refer to was titled “Carbon Emission Policies in Key Economies”. medium-sized (five megawatt) solar PV systems — A$400–473/MWh. Without being certain, my best guess is that some of the groups or websites using the figures of $79 per kilowatt-hour for coal-powered energy and $1502 per kilowatt-hour for wind powered energy may have based their figures on the now-corrected Paul Sheehan opinion piece. There is no credible economic analysis that reports wind power costs at A$1502 a megawatt-hour. As he has readily acknowledged, Alan Jones’ figures on the cost of wind energy are not correct. Are those Productivity Commission figures up to date? The Commission’s report said that in 2010, the Electric Power Research Institute estimated that the levelised cost of coal-fired electricity (without carbon capture and storage) was between A$78 and $91/MWh. For wind, the figure was between A$150 and $214/MWh. At the time the Commision’s report was released (May 2011), these figures were already higher than other reported costs for renewable energy technology. More recent costs for new coal plants have been estimated by the former Bureau of Resources and Energy Economics in their Australian Energy Technology Assessment. This report provides a measure of the cost of a large range of generation technologies, now (or rather, in 2012 when the most recent report was published) and into the future. Using data from Table 5.2.1 of that report, the table below shows the “levelised” cost of energy for some coal and wind technologies. 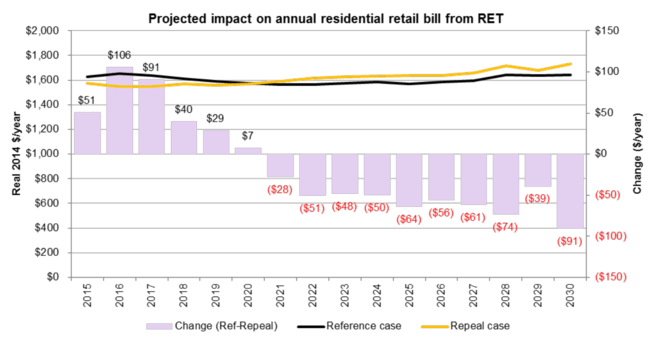 The chart above, from the Australian Energy Technology Assessment 2013 Model Update (Figure 8) also shows more current levelised costs of energy. Does 80% of Australia’s energy comes from coal-fired power? Nearly, but not quite. More than two-thirds of electricity is produced from coal, 19% from gas, and 10% from renewables with the balance from liquid fuels such as diesel, according to the government’s Australian Energy Resource Assessment. In the National Electricity Market, supplying the eastern seaboard, brown and black coal supplied 76% of output last financial year, and 74% the year before that. Does feeding renewable energy into the grid drive electricity prices through the roof? 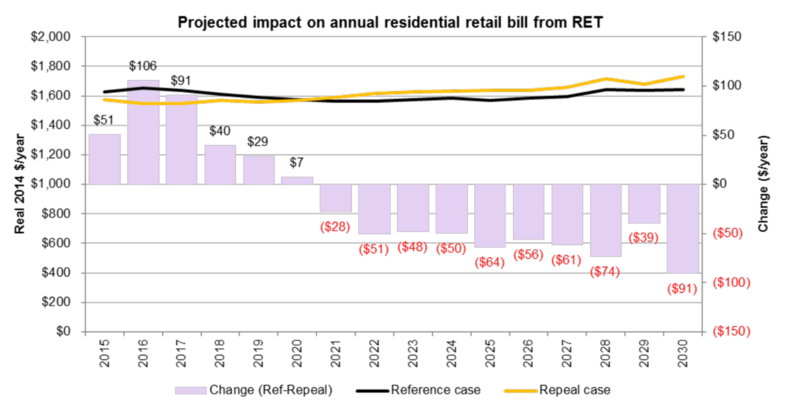 The ACIL Allen modelling estimates that repealing the RET would initially result in lower retail electricity prices, however from around 2021 retail prices would be on average 3.1% higher for residential, commercial and industrial customers. As he has readily acknowledged, Alan Jones’ statement on Q&A on the cost of wind and coal powered energy are not correct. His claim that renewable energy is having a large impact on residential electricity bills also runs counter to modelling commissioned by the government. This is a thorough FactCheck article. Mr Jones’ cost estimate for coal (assuming it is per megawatt-hour, not per kilowatt-hour) is confirmed by the fact checker. This applies to new coal plant, not existing units. With regard to the percentage of Australian electricity generated from coal, the FactCheck author is correct. Some people quote higher coal percentages. First, it used to be higher. Second, some people confuse the percentages of input fuel used to generate electricity (historically easier to identify from public data) with the share of electricity actually generated. Since coal plant is less efficient than some other options such as hydroelectricity, this approach makes its share look bigger. In terms of impacts on future electricity prices, all estimates are based on assumptions. For example, if more old coal generation capacity is retired than some models have assumed, baseline electricity prices could be higher because new generation options of all kinds are typically more expensive than old existing power stations. Will Bill Shorten understand the energy consumer must be king? Not the first time for Jones. Notoriously hyperbolic. It’s disappointing he gets a seat on Q&A, live television, and sputter stuff he admits he has no idea about. He should be edited so his lies can be muted out. So he made the comment ‘in error’ and not the politicians’ favourite ‘out of context’. Wow – that’s progress. Next he’ll be claiming that turbines don’t give you headaches. Well at least he did acknowledge his mistake. The problem with all these figures is that the RE both wind and solar are falling in price whereas the same can not be said for new build black coal let alone brown coal. Seriously… Why does ANYONE listen to this twit?? How can such a moron be counted as an influencer in national politics? It’s like having Donald Trump as a political commentator!! Just ignore the bloke… he’s a media clown. Of course he was wrong! But do you hear him trumpet it on his radio show? NO. Just a meek little email that all the airheads who listen to him will not read. What a jerk! Ken I have had his and his previous of the golden microphone quoted to me as if they were all knowledgeable on any subject. He is a big Jerk on just about everything except fracking and CSG, probably more to do with NIMBY than anything else. Pedro, I must admit that he took that Shenhua mining approval to task on Q&A the other night, and lambasted the Abbott Government that for which he is to be commended. But it was an easy target. The ABC was pillioried by the Coalition and the Murdoch press for allowing Zaky Mallah on Q and A because in the past he had said two Asio agents should be killed and two female journalists should be raped. Stupid, repellant things to say and he was rightly put down for these actions. Alan Jones on the other hand called for the Prime Minister of Australia ( Julia Gilliard at the time ) to be taken out to sea and drowned but no-one seemed to find this offensive in any way. When he subsequently came on Q and A no-one from the Coalition raised any objection to the ABC for allowing him air time after such offensive remarks. He seems to be able to say anything no matter how offensive or untrue and get away with it. At last it’s becoming obvious; wind and solar are rapidly overtaking fossil fuels in price competitiveness. Since it is early in the technology improvements are large and frequent. No matter what delaying tactics ‘business as usual’ try (with puppets like Tony Abbott) it’s sayonara to fossil fuels and probably faster than we think. not if QandaA start next weeks show reading an apology from Jones. He wont want to be repeating that kind of think he has his Pride! The rabbit will quote AJ remarks @ the next election even it’s wrong. Well any thing to go by AJ didn’t care about his pride when was caught cash for opinion gate. The best can happen is Aussies vote with their feet and install more roof solar. Only then Electricity sector will take notice! Regardless of blatant lies and distortions by media commentators, the market is no fool and investment goes where the returns are. Market distortions of course are another matter entirely. Governments gifting fossil fuel subsidies whilst denigrating assistance to renewable energy expose the biggest lie of all. That renewable energy needs to stand on it’s own feet if it expects to compete with coal. That’s it though. The market is badly designed if our major goals are zero emissions energy generation as soon as humanly possible. Even the mechanisms we’ve created to intrude on the market design like RET, CEFC, AREAN aren’t working well enough, at all in the case of the RET in the past 2 years. The market needs a redesign on first principles of encouraging zero emissions at best possible price. At the moment the market encourages best wholesale price and is indifferent about emissions. If this was software we’d have seen version NEM 2.0 a decade ago. In other words I apologise for the mistake but I still wish to say that wind is three or four times dearer than coal. So three or four times $79/MWh is $237 to $316/MWh but wind is $111 to $122/MWh (AETA 2013 data) which is 1.4 to 1.5 times in my mind. Basic arithmetic is clearly not one of Alan’s top subjects. Is that another Alan Jones mistake or more propaganda or just proper gander as you might expect from some one who can duck and weave better than a drake? Alan, in 2013 wind was about one and a half times coal and falling while coal was rising. By 2020, AETA data shows wind and black coal are equal and that is Tony Abbott’s Industry departments data. If one started to build a coal fired power station now it would take until 2020 to commission it. Get over it wind is cheaper than coal for generating electricity and that is without any carbon price included in the analysis! End of story for coal. “It takes a lot of energy to extract and process solar-grade silicon,” says co-author Seth Darling.